Ok Ok – I am a slack blogger but it’s the holidays and in a week my entire household will be packed into a truck – did I mention I am stressed? I was thinking how slack I’ve been in regard to local arts – some might say ‘dismissive’ (actually they have). The Mahara Gallery is my local and I could have been more supportive. For a tiny underfunded gallery they do some pretty good shows. I was an idiot and missed the 2nd version of “the Real Art Road Show” there recently too. I see Matt Couper has a piece in it too which I would have liked to see. He was also the recent (very polite) recipient of an odd email from me (meant for another Matt) regarding a comparison of Star Wars to the Bible. Why are Dunedin rental agents so awful? I’ve also come across a blog recently that is like hearing one side of a very personal conversation. Why? I actually have many regrets about things I have not been able to do before leaving Wellington – oh well. I’ll just put on Mr Vicious and Co and their version of My Way instead. I had some time to stop by the Mahara Gallery again yesterday to see their new shows. I was lucky to have a quick chat to Director Janet Bayly and also to tag along on a curators talk they were giving. At the moment they have RAY (Real Art Youth) which is work made following the recent visit of the Real Art Road showto the regions schools which kicked off at the gallery. 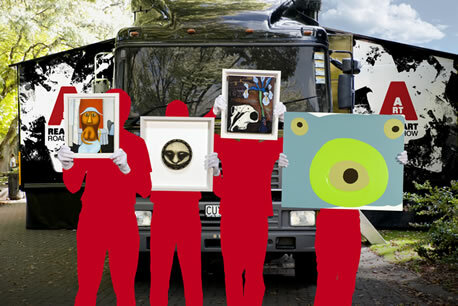 Only a few of the works were from direct inspiration, but the floortalk pointed out a few more that had links to artworks that were “in the truck”. Although a lot of it is what you’d expect from a high school art show, there were some very ‘sophisicated’ pieces amongst it from the students (a few of the teachers works were also included). One thing I thought was great was that the gallery had framed up some works which really gave them a whole different look – a valuable exercise for the students and actually to the viewer as well, making me think about the value and process of ‘framing’. The art also made me wonder about where these kids will end up after school and whether I should “buy now” from some very promising talents. I was surprised that there wasn’t more ‘edgey” stuff but maybe taggers and/or bombers don’t take high school art or perhaps what they produce doesn’t end up on gallery walls. There were some that looked very much like Jacqueline Fahey’s skatepark and ‘Bringing it Home’ series – but that was just my interpretation. So how many of these artists will go on to art school (or not) and become the future of NZ art?? Also on show were new works by Neville Smitheram now residing in the Horowhenua. These mostly paper works of encaustic and acrylic were fantastic. Geometric, digital – but an analogue take on it and something quite ethereal about the waxed paper. I imagine this type of work is quite challenging to gallery regulars but I feel its great to see work like this in the mix. Lastly was what I would call ‘outsider art” which could be easily dismissed. Local artist (and builder) Rhys Collier had a short film “My Dreams are Death” and assemblage pieces on show. I was kind of repulsed but drawn to a work, “Burnt” which consisted of burnt wooden boards, bloodied foot prints and a highly lacquered red (bloody) fibrous mass. I would have happily taken this home (although it would not have got a good reception). I used to work in a healthcare field and can say this is a truly visceral artwork and ‘spot on’. In my view, Colliers other works didn’t compare. The Mahara has been described as “the little public gallery that could” although it faces challenges with location and the building. However, some significant shows continue to be mounted here that acknowledge and perhaps are more suited to the intimate spaces. Don’t expect to read anything mind expanding here today! Its been really hard to get anywhere to see anything lately (still considering that ‘donate’ button) so I also stopped back in to the Mahara Gallery to look over the Hodgkins/Pick exhibition again. Mark Amery wrote a review in today’s DomPost that really summed up the Hodgkins work well – but hardly a mention of Pick. Personally today Summer Joys (1916) struck me. It seemed so vibrant and full of movement and what was really weird was that they way it was painted (post-impressionist?) meant that it could equally be a modern scene. I was thinking about becoming ‘involved’ with the gallery in some way but I can’t really see that I’d be much use. 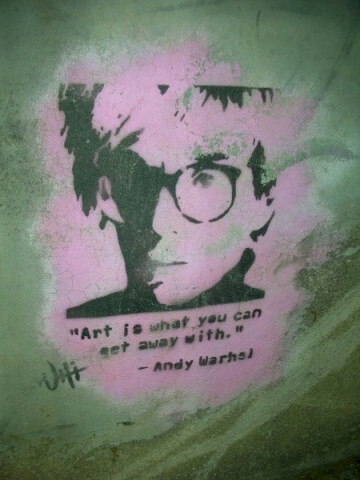 I was also thinking about doing some ‘real’ art history study. I see Vic offers a graduate diploma which would be good but I haven’t really go the time right now to go in and attend lectures so I guess I’ll stick to my self-education programme and continue to stumble along blindly. The only big advantage right now would be to give my research some ‘legitimacy’. So lastly a picture relevant to today’s expedition and how I would have ideally liked my day to have been. Due to a gap in my schedule I found myself at the Mahara Gallery in Waikanae at an exhibition (Part of the Arts Festival program) of Séraphine Pick (After Image) and Frances Hodgkins (Her Idea of Heaven 1896-1921). I am NOT going to write a review because I’m no good at it, but it was good to be able to view a selection of Pick’s more recent works and see again what I think was the Artsville documentary about her that was showing. 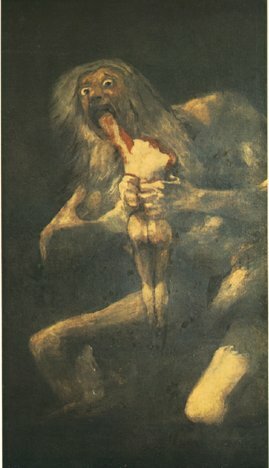 I loved the fact the Goya image of Saturn eating his child affected her in childhood as it did me. There were some confusing points which are mainly (I hope) typographical errors, which I guess is nit-picking. The website said “this exhibition presents new work [of Pick’s] made since 2006” but the list of works in the catalogue (with only 3 images in it and costing $3) has pictures dating back to 1997, while inside it reads “the earliest work in this exhibition , Looking Like Someone Else 2007″ and is actually a 1997 painting. No matter. What I didn’t ‘get’ was why there was the “companion” exhibition of Hodgkins. Ok they are both female NZ painters, who supposedly “love the physical act of painting” and Pick was the Hodgkins fellow in 1999. To me it ends there. Oh ok, they both paint(ed) babies. 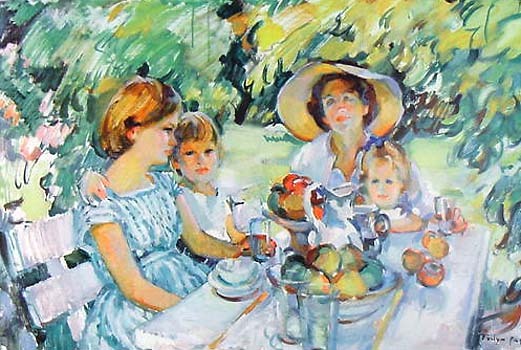 Actually Pick’s baby paintings were stunningly different and I liked all her family portraits a great deal, but that might be the mummy showing in me. Why not just fill out the gallery with some more of Pick’s work? Its not a large place and there weren’t that many Hodgkins on display ( a collection of “iconic works” grrrrrrrrr!). The Hodgkins tie-in with Waikanae is that her sister Isobel lived near there and I believe (?) her ashes are interred in the local cemetary. Of the pictures on show, the series of 4 Douarnenez watercolours (1921), in a more modernist style were a highlight. These were drawn from the Field Collection (Isobel was married a Field). The Mahara Gallery itself is a little weird. It’s a bit of a concrete block bunker, but they have some good shows there and you see a lot of local advertising. It would seem to have potential for much more. Maybe its the location, which might be difficult to find and is off a typical example of 1970/80s urban planning – Mahara Place – with requisite fountain and sculpture. I suspect funding and support from the council are big issues as well as management changes. Funnily, I saw some people today that I strongly suspect had come out from Wellington for the exhibition as they looked so out of place. I hope they enjoyed the trip and the Ambrosia Patisserie too which is well worth a visit and close by the gallery (I am not getting a kick back for that comment either). While I was at the Gallery, I picked up a Real Art Roadshow sketch pad. I am really impressed with this idea and the website is great. The artists interviews are definitely worth a look. Yet again something I missed. Although a lot of the ‘usual suspects’ were included, it was wide-ish variety. I’ve just realised I have written about Hodgkins and Pick without including a single image of theirs. Oh well I guess you can use google.